CLASSIC DEEP DIVE | But was it really so unprecedented? Shockingly, Final Fantasy VII turned 20 years old about a month ago. With its dated computer graphics and chunky polygons, it certainly looks its age... but it doesn't really feel it. Final Fantasy VII would be the global breakout hit for developer and publisher SquareSoft — now Square Enix — because back in 1997, its heady mix of text-driven narrative, menu-based game mechanics, and visual storytelling combined into a work that seemed practically unprecedented. In fact, for the handful of die-hard American console RPG enthusiasts who had already fallen into Final Fantasy's orbit with its well-received but ultimately niche 8- and 16-bit U.S. releases, FFVII took things a little too far into new territory. I remember getting into plenty of message board debates with staunch traditionalists who angrily insisted that FFVII "lacked that 'Final Fantasy' feeling." And, to a degree, they had a point. With its detailed yet gloomy visuals, frequent cinematic cut scenes, and its oppressive, droning, synthesized soundtrack, FFVII had a wholly different vibe from its predecessors. But in most ways that count, FFVII was very much a Final Fantasy game through and through. As with other legacy franchises to successfully make the jump from 16-bit 2D to 32- or 64-bit 3D, Final Fantasy's creators weathered that change in large part by sticking to what they knew worked. With this Design in Action series, I'll be exploring the ways in which FFVII helped revolutionize the entire concept of gaming by basically working from the rules laid down by its six predecessors... and when it deliberately, and effectively, changed the rules. There's no better place to begin with this study of FFVII than right at the beginning. I can't imagine the game would have had nearly so much impact had it not pulled in its audience right from the beginning, and I can't imagine any opening pulling in an audience quite as powerfully as the one SquareSoft went with. I almost don't need to describe it, so ingrained has it become in the collective gaming conscience, but: The game opens with a slow tracking shot through outer space, accompanied by ambient sounds and a sustained synthesizer chord. Just as you begin to feel restless at what amounts to a lot of nothing, the scene cuts to a flash of a young woman's face. The star field becomes embers rising from a fire, where the woman has been warming herself against the cold. She turns from the fire, stands, and steps out of an alcove into a bustling city street. The camera pulls away from her, showing more of the lively street... and then keeps pulling back, back, and further back. The music begins to swell as the camera continues its ascent, zooming back from the girl, from the street, from the block, revealing a massive high-tech city whose scale causes the woman's entire neighborhood to vanish into nothing. I can't imagine the game would have had nearly so much impact had it not pulled in its audience right from the beginning. The title appears, superimposed atop the enormous hub of the megalopolis: FINAL FANTASY VII. Suddenly, the title screen becomes intercut with images of a speeding train, echoing the city's visual motifs of technology, steam, and wheels. The train speeds past, cross-cut with a bird's-eye view of the city as the camera zooms back in and the music reaches its crescendo. But this time, the camera tracks in to a different part of the city than where it started, focusing on an area slightly clockwise from the neighborhood where the flower girl was warming her hands. As the point of view descends into the city, it slowly becomes clear that it's zooming in to give a perspective on the train, which slows and comes to a halt at a train yard. As the machine comes to a halt, the camera swoops down to the ground, revealing a pair of guards standing by the side of the tracks. A trio of commandos leaps from the train, knocks the soldiers unconscious, and scurries through a distant door as a barrel-chested, dark-skinned man and a wiry blond kid hop off the train as well. "C'mon newcomer. Follow me." The dialogue appears in a text bubble centered above the larger man, who then marches after the commandos into the distance. The blond man is left standing alone in front of an unconscious soldier. And, suddenly, seamlessly, the game has begun. From there, players take control of the guy with the spiky yellow hair. For the moment, he's simply "Ex-SOLDIER," but in a few moments you learn his name. It defaults to Cloud, but FFVII having been created in the days before mandatory voice-overs, you're also allowed to give him the appellation of your choosing. You're left to follow the big guy — Barrett — but not before being accosted by a couple of masked troopers, who (despite wielding submachine guns) each go down in a single swipe of Cloud's oversized broadsword. In about two minutes from hitting New Game at the title screen, FFVII gives you an extraordinary amount of setup and context for the game's story. We meet the protagonist, learn that he's impressively skilled at combat, and has been newly recruited for what appears to be some sort of guerrilla force. We get a glimpse of the massive city of Midgar, dominated by an enormous central building and ringed by multiple smoking reactors, and even enjoy a taste of the game world's technology level (quite advanced, albeit with a retro vibe). We also get a glimpse of a key character in the story — Aerith, the flower girl — with a subtle bit of spatial context to justify her fateful run-in with Cloud following the opening mission: Her neighborhood is at the 11 o'clock point on the Midgar wheel, while the Bombing Run takes place at around 1 o'clock, with the two locales separated by the enormous reactor that Cloud turns out to be on a mission to destroy. And to top it all off, that initial, drawn-out view of outer space means something, too. The game's primary threats — JENOVA, the alien force who seemingly initiates the entire story, and Meteor, the doomsday catastrophe that looms over the game's third act — both come from beyond the planet itself. It's a marvelous example of efficient storytelling, and it really makes the most of the PlayStation's technology. Sure, the CG cutscenes ultimately were nothing truly new; Dragon's Lair introduced the idea of relaying game narrative through movie-quality animation nearly a decade and a half before FFVII's debut. What made FFVII's cut scenes so impressive had everything to do with their overall aesthetic, with a pre-rendered computer visual look that made them resemble a more refined take on the in-game graphics. Even more to the point, FFVII didn't sacrifice the classic concept of gameplay in order to make room for these visuals. Dragon's Lair and the countless "Siliwood" FMV adventures that followed throughout the ’90s amounted to barely interactive slideshow, reducing the player's control over events to making quick selections at a few story junctures. 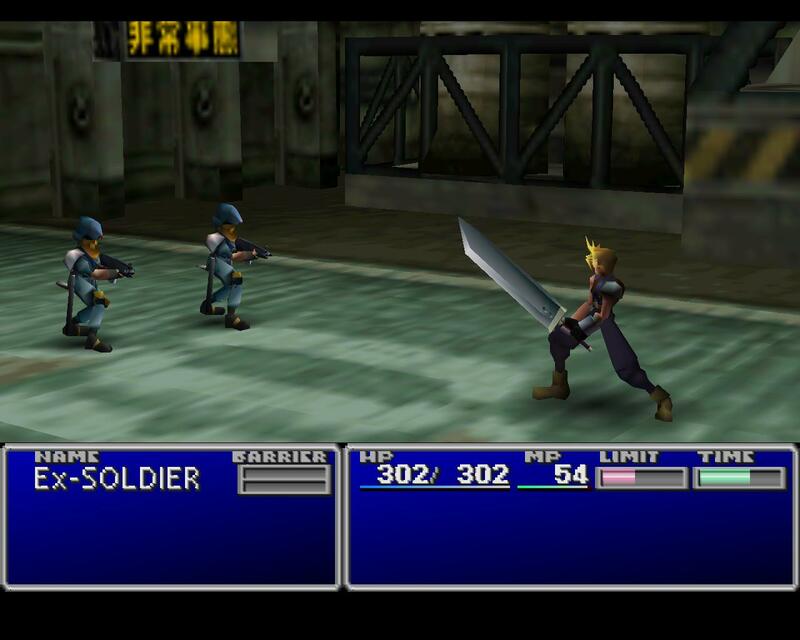 FFVII, on the other hand, retained all the play mechanics and player freedom of the previous games in the series. On top of that, it was the largest and most epic quest yet seen in Final Fantasy. Rather than compromise its core RPG principles, it expanded on them. In fact, the opening sequence of FFVII — from the dive into Midgar through the reactor's explosion 15 minutes later — plays up a long-running trademark of the Final Fantasy series. It's the game playing to a strength of its legacy, and doing it in a bigger, better way than ever before. Before Final Fantasy, RPGs tended to start the same way: You'd roll and name your hero or guild, meet the king, get some gold, do some shopping, and finally head into the dungeon. And even the original Final Fantasy took this tack. But it began to subvert the genre almost immediately. The king of Cornelia task the Warriors of Light with a quest to rescue his abducted daughter, a mission that would comprise the bulk of most RPGs. But the rescue of Princess Sara takes roughly 10 minutes as you trek a short distance to the north, face a would-be villain, and save the girl. Your rescue efforts amount to a prologue. With Final Fantasy II, however, Square's designers began to downplay RPG standards in favor telling a more interesting story. That game begins literally in the middle of a battle: The four protagonists enter the scene embroiled in an unwinnable fight, and you can only begin to begin the quest once you fall to the bad guys' swords and awaken in an inn. Final Fantasy IV went well beyond that, with the game fading from black to center on protagonist Cecil as he soars through the sky in an airship, mulling over the events of a just-completed mission. And Final Fantasy VI took the prize, with players controlling a nameless and powerful young woman accompanied by a pair of soldiers as they invaded a peaceful town for nefarious purposes. Before Final Fantasy, RPGs tended to start the same way: You'd roll and name your hero or guild, meet the king, get some gold, do some shopping, and finally head into the dungeon. And even the original Final Fantasy took this tack. But it began to subvert the genre almost immediately. Final Fantasy made in medias res openings its stock in trade, abandoning the usual workings of RPGs in pursuit of a more compelling approach to storytelling. Players lost the ability to define their party in advance, instead meeting a key character or two right away and steadily impressing like-minded warriors into their team along the way. Similarly, the ability to select character classes and skills along the way was replaced by new systems: Heroes with set classes whose abilities could be customized through player selections along the way, or completely mutable party members whose skills sets could be swapped instantly through a menu command. Final Fantasy's long-running commitment to driving action by way of a strong central narrative changed the way its approach to role-playing system worked. Yet despite the lamentations of computer magazine reviewers whose first exposure to the franchise came with the PC port of FFVII, those changes didn't debut with this game. FFVII finally allowed ambitious storytellers like Yoshinori Kitase and Hironobu Sakaguchi to present their game in the style of a movie... but ultimately, FFVII was still a game that abided by the principles of previous entries in the series. Heck, FFVII's Bombing Run is more or less a straight redux of FFVI's introductory invasion of the town of Narshe. The biggest difference between the two games is the FFVI's cinematic aspirations were really limited to displaying game credits over a slow-scrolling animation loop, whereas FFVII could use advanced camera trickery, change the scene in an instant, and revel in character close-ups. And nothing in video games had prepared us for the moment that the pre-rendered video of a decelerating train became a static background of the type that FFVII would use throughout the adventure. The trick of superimposing a pair of enemy sprites over top of the video, who then seamlessly interacted with Cloud's guerrilla crew, helped sell an incredible illusion that FFVII really was an interactive movie... even if, at heart, it was still an RPG. It remains a top-10 mindblowing game moment for many fans, a standout even withing a console generation that delivered innovation after innovation as a matter of course. Next time: Living in a Materia world. Tagged with Analyses,	Classic Deep Dives,	Retro,	Role Playing Games,	Square Enix,	squaresoft.